AIMS is a revolutionary system available to bulk commodity handlers for moment in time, displacement and supply verification audits. These audits are of huge value to our clients, collateral managers, financial institutes and auditing firms. AIMS audits allows for a moment in time tally of your stock on site, in the bunkers and flat warehouses, or at railway sidings. Managers are able to plan accordingly by having knowledge of the exact position and quantity of the bulk stock, throughout the logistics chain. Once an audit has been completed an audit report is generated and supplied to the client. 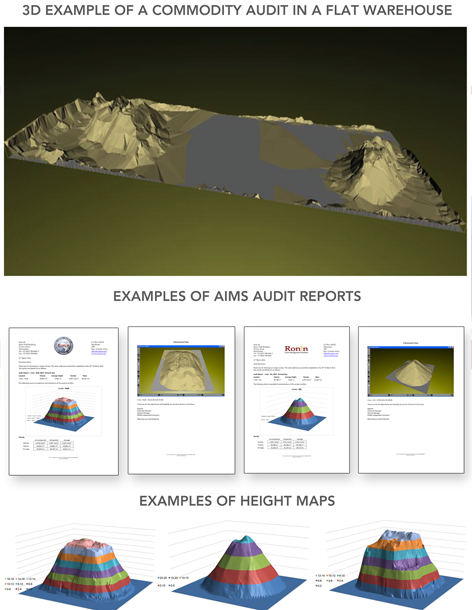 This report contains information such as 3D representations of actual stock within the bunker of flat warehouse, Tonnages, Bulk Densities, Volumes and Heighgraphs. Additional information such as contamination and hot spots can be supplied on request.